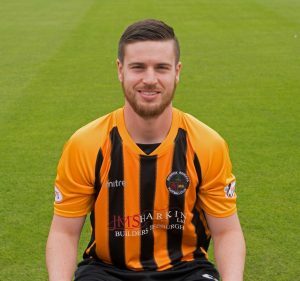 Blyth Spartans have moved quickly to secure the signature of free agent Greg Rutherford – after the striker was released by Berwick Rangers last week. The 23-year-old – who was named Scottish League Two Player of the Month back in March – joined Berwick in October 2016, but the former Hartlepool United youngster was forced to leave Shielfield Park at the end of last month due to his teacher training commitments conflicting with professional football. Having also represented Dover Athletic, Alloa Athletic and Arbroath in his career, Rutherford has a wealth of experience to bring to Alun Armstrong’s side. However, the forward revealed he’d considered making the switch to Croft Park a lot sooner than he has. When asked about signing for Blyth, Rutherford replied: “It’s something I’ve considered in the past. I thought about coming here before the end of last season, but – having spent so much time in the Scottish League – I felt it only right to stay there. “However, after a long hard think about it, it’s nice to be part of the Blyth Spartans setup. It’s on my doorstep, it’s a club I’ve always kept an eye on and it’s nice to finally be here. With Daniel Maguire having led the line for the majority of his time at the club, he’s almost cemented his name into the starting XI. However, Spartans’ latest acquisition insists his qualities can help ease the burden on Maguire up front and he was quick to set himself a target to help fire Blyth towards a decent first season back in the Vanarama National League North. Rutherford added: “First thing I’ll bring is hard work – as I always give 110%. I’m a striker who loves to get in behind the defence and be a menace up front. “I’ve looked at the club’s recent results and you can see instantly we score a lot of goals and create a lot of chances. As a striker, you want to be a part of that. Rutherford will have to wait to make his Spartans debut, however – as he is still in the process of gaining international clearance, which could take up to three weeks to complete.